One of the brand new Age of Bronze posters. I'll be at booth BB1 in Artist Alley at San Diego Comic-Con starting Wednesday evening, July 20, and running through Sunday afternoon, July 24. Six new Age of Bronze posters will be for sale at my booth. 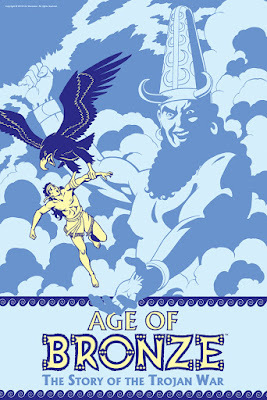 Each of the posters is based on a cover for an issue of the Age of Bronze comic book series, including the image at left, originally drawn for issue #23. Also available are all four graphic novels in the Age of Bronze series so far, A Thousand Ships, Sacrifice, Betrayal Part One, and Betrayal Part Two. In addition, we'll have Oz posters, the recent Welcome to Oz coloring book, the new large deluxe edition of Little Nemo: Return to Slumberland, and more. Come see me and my partner David Maxine at booth BB1 at the San Diego Comic-Con at the San Diego Convention Center on Harbor Drive in downtown San Diego, California. For more info about SDCC, here's the link.